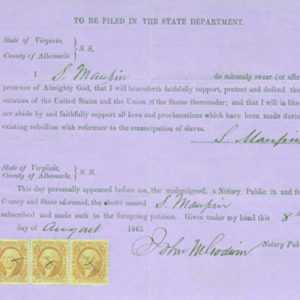 University of Virginia Library Online Exhibits | Loyalty oath signed by Socrates Maupin. 1865 August 8. Click image for larger view. Loyalty oath signed by Socrates Maupin. 1865 August 8. Click image for larger view. “Loyalty oath signed by Socrates Maupin. 1865 August 8. 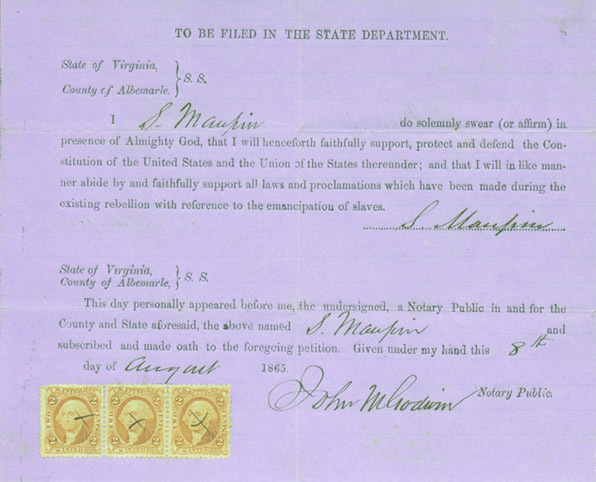 Click image for larger view.,” University of Virginia Library Online Exhibits, accessed April 25, 2019, https://explore.lib.virginia.edu/items/show/2127.